Federal officials have long struggled to balance coal’s hidden costs against its more conspicuous role in providing half the nation’s electricity. Hoping for a technological solution, the Obama administration devoted $3.4 billion in stimulus spending to foster “clean-coal” plants that can capture and store greenhouse gases. Yet new investments in traditional coal plants total at least 10 times that amount — more than $35 billion. Utilities say they are clinging to coal because its abundance makes it cheaper than natural gas or nuclear power and more reliable than intermittent power sources such as wind and solar. Still, the price of coal plants is rising and consumers in some areas served by the new facilities will see their electricity bill rise by up to 30 percent. Industry representatives say those increases would be even steeper if utilities switched to more expensive fuels or were forced to adopt emission-reduction measures. Approval of the plants has come from state and federal agencies that do not factor in emissions of carbon dioxide, considered the leading culprit behind global warming. Scientists and environmentalists have tried to stop the coal rush with some success, turning back dozens of plants through lawsuits and other legal challenges. As a result, current construction is far more modest than projected a few years ago when 151 new plants were forecast by federal regulators. But analysts say the projects that prevailed are more than enough to ensure coal’s continued dominance in the power industry for years to come. Sixteen large plants have fired up since 2008 and 16 more are under construction, according to records examined by the AP. Combined, they will produce an estimated 17,900 megawatts of electricity, sufficient to power up to 15.6 million homes — roughly the number of homes in California and Arizona combined. They also will generate about 125 million tons of greenhouse gases annually, according to emissions figures from utilities and the Center for Global Development. That’s the equivalent of putting 22 million additional automobiles on the road. The new plants do not capture carbon dioxide. That’s despite the stimulus spending and an additional $687 million spent by the Department of Energy on clean coal programs. DOE spokesman John Grasser acknowledged the new plants represent a missed chance to rein in carbon emissions. But he said more opportunities would arise as electricity consumption increases. Experts say the widespread application of carbon-neutralizing technologies for coal plants remains at least 15 to 20 years away. Producing clean coal power appears straightforward: Separate the carbon dioxide before it goes up the smokestack, then store it underground in geological formations. Experimental trials have been successful but putting the concept into commercial practice has been stymied by high costs and the difficulty of isolating carbon dioxide from other gases. Inside the plant, a ton of coal per minute rumbles off conveyor belts from the nearby WyoDak mine. Hulking steel pulverizers crush the fuel to the consistency of baby powder, fans blow it into a giant furnace and the coal goes up in flames that can top 1,700 degrees Fahrenheit, producing steam to generate electricity. WyGen is more efficient than earlier plants, burning about 20 percent less coal. Yet the process itself has changed little since Thomas Edison built the first plant in 1882 in Manhattan. 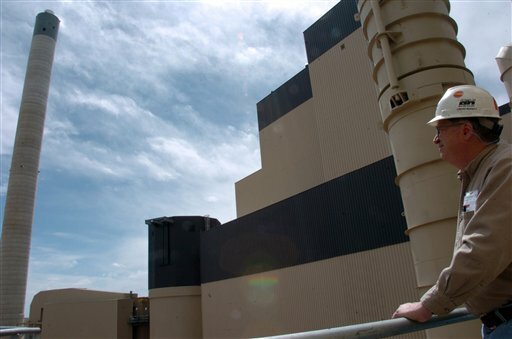 And while dramatic advances have been made at the back end of coal plants — where Wygen’s operator, Black Hills Power, removes most of the nitrogen oxides, sulfur dioxide and other acid-rain pollutants — efforts to curb greenhouse gases have lagged. Black Hills spent $80 million on pollution controls for WyGen, bumping up its price tag to $247 million. Like most of the new fleet of plants, space was left at WyGen for the future installation of carbon-capture equipment. As climate change emerged as a global dilemma in recent years, the coal industry at times appeared on the ropes. Environmentalists trumpeted 100 plants dropped or delayed. Regulators imposed tighter emission limits for acid rain pollutants and reined in destructive mining practices. And the recession dampened consumer demand for power, prompting some utilities to scrap expansion plans. But coal has not gone away. “The reason coal burns in this country is not because anyone likes the smog. It’s the cost,” said Daniel Scott, a coal industry analyst with Dahlman Rose & Company in New York. If we put a gradually increasing price on atmospheric carbon pollution, soon, humankind can probably avoid the most catastrophic consequences of climate change. If we don’t, our grandchildren will be living on a planet that is horribly inhospitable to life and human civilization. This article is really misleading, calling the newest plants “old school”. Commercial-scale carbon capture still does not exist. Nevertheless, the new plants are far more efficient than older ones for emissions of PM, NOx, SO2. Similar to your car getting better gas mileage, the new plants produce produce far more power per ton of coal, and their back-end air pollution controls are also far more efficient at capturing and destroying emissions. 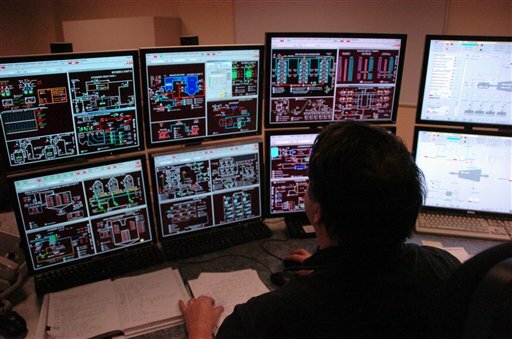 The power industry is making the most of available technology, and their air permit emission permits are tighter than ever before. When commercial carbon capture technology is ready, and the legal issues for sequestration have been sorted out, it can be added to these new plants. The trends in coal plant construction are driven by two important constraints on the coal-fired power industry: lack of railroad capacity and air pollution limits in populated areas. Note that all of the plants mentioned in the post are located in or near Wyoming, South Dakota and Montana. There is basically one transcontinental freight line available to carry coal east from the Powder River Basin. 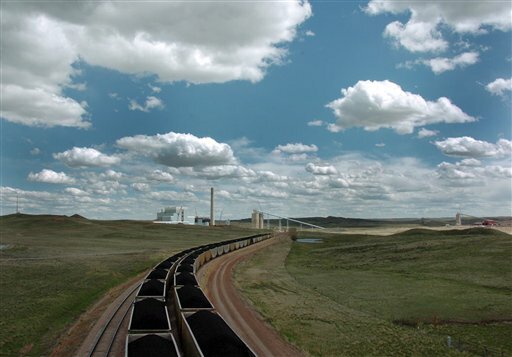 South Dakota’s lignite is so low in energy output that it is not cost effective to transport it anywhere, and it must be burned at or near the mine mouth. The solution to these transportation constraints is “coal by wire.” Build power plants near coal mines and send the electricity out on new transmission lines. That is what is happening here. What? The electrical power industry and Al Gore have been telling us we need a new “Super Grid” (Gore’s phrase) to handle all the massive amounts of new land-based wind energy. Sorry. That won’t happen until the coal runs out. The real agenda, that no one talks about is Coal By Wire. That’s the plan for at least the next 50 years. Air pollution limits in major cities prevent any new coal burning plants in urban areas. City dwellers and suburbanites want their electric cars, but the rural population that lives near the new coal plants will be feeling the impacts of lung disease and cancers from the stacks of the new coal generators. Electric cars will reduce gasoline tailpipe emissions that now create air pollution around cities. Electric cars, or electric subway trains, run on power of which about 45% comes from coal. President Obama, by pushing the electric car industry is not really pushing “electric” cars, he is pushing coal burning cars. Coal burning electric utilities and the steam coal industry in general think that they need to be ready to meet the new demand from electric cars/mass transit. They are building new plants, and the giant transmission lines they need to get power to cities, to meet that new demand. If Congress continues to play with cap and trade schemes instead of imposing clear carbon taxes and tariffs that will restore US manufacturing, then we will continue to see new coal burning power plants. When were these plants initially financed? That is the key –along with the fact that they are all sourced by western coal. Like GenPower’s Longview, most of them secured their financing several years ago, before the major lenders put a freeze on financing for proposed coal plants that don’t have CCS. Try to go out today and get financing and regulatory approval for a new non-CCS coal plant — especially located in and/or sourced by the eastern United States. Which lender will give you sufficient credit? Bill Howley — all good points and good information. This language might just unfairly disparage the years of work by of serious economists who care just as deeply about global warming as you and I do. They believe that some form of cap and trade is the most efficient and globally feasible way to turn the giant global ocean liner of the world economy in a safe direction. It’s possible they are correct. It’s also a question of politics. The hard and very difficult-to-swallow truth is that unless climate policy legislation can attract a significant number of Republican and coal state Democrat votes, it won’t pass. Again, many deeply concerned people who have been in politics for a long time have reasonable views on how to get those votes, and have put energy into cap and trade for that reason. I think it’s good to acknowledge and appreciate the great effort that very smart, idealistic people are putting into climate policy plans in many different ways, including cap and trade — even as we suggest improvements and share our views (and ignorance). That goes along with my appreciation for the rank-and-file coal miners who help generate the electricity I am using as I type this (but not for the absentee landowners who get the lion’s share!). I have to disagree with you about cap and trade schemes. They are not about reducing CO2 emissions. The most effective cap and trade system yet put in place in Europe took over a decade to have even a minimal impact. The free credits negotiated by AEP and other coal burning power companies in the recently failed Senate energy bill dwarfed the large number of similar credits granted in Europe. And even those giveaways couldn’t get the Senate bill to the floor. So the argument that only cap and trade schemes can get through Congress is not so strong, given the failures to date. I characterize all the lobbying and giveaways as “playing” because the people with power don’t really want to see anything substantial happen. Why not do what scientist James Hansen has recommended? A simple plan – tax all carbon emitters based on their emissions and return the entire tax to all US residents equally. It is a net zero tax on citizens. Any increase in energy prices from the carbon tax is offset by the tax refund to citizens. Emitters get no breaks. Combine this system with carbon tariffs on all imported goods based on the carbon emissions of their countries of origin. As Rubin points out, North American manufacturers are about 30% more carbon efficient than their Chinese counterparts. Domestically produced US goods would instantly become more attractive to US consumers. The best part of all is that the law itself could be no more than five pages long. And it would be easy to explain to the public, unlike the huge carbon amendment that just failed. Sorry to get off topic, but I wanted to respond directly to Tom. I am not anti-cap and trade, but that system is an industry brainchild that is designed to be so complex that the politicians can’t sell it to the public. Why not go with a plan that is effective, simple and easy to explain? It is possible to disagree with people about strategy without impugning their sincerity or intelligence. It’s even better to vigorously try to understand the virtues that undoubtedly do exist in their ideas, even though you may think there are probably better ideas. Bill, because I try to trust my buddy’s judgment (I’m neither a politico or an economist), I think what you say has a lot of value. I also think, as my buddy suggests, there are political realities that make the best systems very hard to accomplish. There are people who think James Hansen has a political “tin ear.” Certainly his calling coal trains “death trains” did not help us here in West Virginia to build leverage to manage this godawful situation. I have neighbors who work on those trains. The best way to manage this terrifying situation is to realize that we are ALL in it together. This is not about “the environment.” This is about survival. The richest and most corrupt power brokers are going to have to be part of — they are going to have to lead, in fact — to get to and implement a solution. I am not questioning anyone’s sincerity or integrity. Even the most sincere people can just be wrong about policy questions and what will or won’t work. I have been listening to my Congresswoman Capito calling the Senate cap and trade amendments carbon taxes. The fact is that the coal industry and their friends will call any limits on carbon emissions a tax. They can’t or won’t be convinced. The people who will have to be convinced are everyone else in the US. Sen. Byrd was right to say that if WV politicians didn’t show leadership and engage with the rest of the country on this issue, we would get left behind. We have not been left behind yet, because a former senator from a coal state is in the White House. Yes, James Hansen is a scientist, not a politician. As a scientist, however, he knows that we may already have passed the point of no return on climate change. His rhetoric is also sincere, and it very well may be right. Policy wonks like complicated legislation. Most voters, however, don’t. The simple policy solution is staring us in the face on carbon, but we do not have political leaders who have the courage to push for it. The world has already blown by the 350 parts per million CO2 limit that scientists say is needed to maintain climate equilibrium. We moved quickly to the present 390 ppm. The Senate fiddles while Rome burns. I agree with your point about survival. As George Carlin pointed out, “the earth” will do just fine, it’s the people who are dying now as the earth’s climate changes. Please check the email address you used to sign in to Coal Tattoo and you’ll see a message from me explaining why your comment has not been publicly posted. Political courage is almost an oxymoron. You don’t “convince” those folks with anything other than votes. It’s not about the politicians, it’s about US — we have to keep getting smarter and stronger. And we have to form alliances with powerful people — like say, the people who own AEP — to get things done. I’m ready to find common ground with the Devil herself to help get this nation started on the emissions reduction path, and in a market economy, as we agree, one form of price or another on emissions is the only way to do it. What did you think of my buddy’s analysis? Have you looked at the Larson or Cantwell-Collins approaches? I think they are in line with your thinking. But my pal says they don’t have much of a chance as currently proposed. Again, great dialogue. We have the curse of living in interesting times. I looked at the Climate Policy Center site and saw the features of the Cantwell Collins bill. It is certainly a step in the right direction in terms of simplicity. Talk of “downstream” and “upstream” and “carbon collars” is still too esoteric for my taste. Why not tax carbon emissions at their source and refund all tax revenue to citizens? Don’t want to call it a tax? OK, call it a cap with penalties as Cantwell Collins does. Congresswoman Capito, and Sen. Rockefeller will still call it a tax, so, whatever. Why not start with a carbon tariff, even without any domestic cap or tax? No emitters in the US get hit, and the biggest, least carbon efficient energy user in the world (China just passed the US last month) gets penalized for its carbon emissions. And we create manufacturing jobs in the US. How is that not politically palatable? You could even sweeten the deal by refunding all the tariff revenue to US residents. But then the free traders would be upset. There are probably far more extreme free traders in the Senate than there are extreme pro-coal Senators. The Millionaires’ Club will not be producing solutions. Real solutions are happening all over the country, but Congress will be the last to embrace them. And those new coal fired plants? (Ah, yes, back on topic) They were planned and financed when electricity demand was projected to rise indefinitely. The electric car developments they are hoping for are unlikely anytime soon, because the economic collapse will continue, so no one will be able to buy the new electric cars. Both consumers and utilities are learning that it is cheaper and faster to simply reduce electricity use than it is to continue mindlessly using more and more power and building more big generating plants, of any kind. Demand for electricity has been collapsing now for more than five years, and not just because of the economy. Real energy leadership is now in the hands of average citizens, not in the Congress. Bill — all good points. You keep asking “Why not?” It’s a rhetorical device, but you also answer it by showing what the political obstancles are to the approaches you are suggesting. Then you end up saying no help will likely come from Washington. That attitude may be a recipe for disaster. There is a broad consensus of experts that we have to have and can have a national and global carbon-pollution-pricing mechanism/architecture to reduce emissions. This is the view of a lot of good people whose views one should not be simply dismissive of, which is where I started this exchange. Well, we don’t have 20 years. We’ve already used up any time we may have had. Our energy policy lags far behind the science of climate change. Our political system is simply not up to the challenge. Absent a broad based grassroots opposition to burning coal for electricity we are in for more warming, and at some point, maybe we have already, but at some point we will hit the tipping point and then there will be nothing we can do, even if the entire GOP delegation takes to riding bikes to the Senate. But I find the notion that we can only ask for that which is politically possible to be very irrational under these circumstances. Keep in mind that the electric utilities are the coal consumers — their commitment to coal has wained greatly. I have not seen (nor will I see) the economic analysis of coal vs. natural gas fueled-electricity that includes all the factors such as power plant location (transmission line loss), waste disposal costs and longterm liability for coal-associated facilities. Coal became the dominant fuel for electricity because oil availability disappeared in the early 1970s and natural gas supplies did not exist. Now natural gas supplies exist — and the government is again financing nuclear power — so coal-fueled electrical power will decline — very quickly — no matter what Congress does or doesn’t do. People are many a lot of money from wordsmithing this stuff. Mike: I agree with much of what you say. And we all recognize, I think, that unless many of the changes we need are embodied in legislation and executive and judicial policies, they will not occur. How to get these changes to take place is the strategic and tactical issue, and of course there are many aspects of that, including action in the streets, as they say. We’re all in this together you and me. It is always interesting, often entertaining, to read the variety of responses to energy and climate topics. Where people get their information and what logical filter they use to test its veracity, if they even use a filter at all, is often evident. James Hansen is a fine, accomplished NASA scientist, but he is not a climate expert. There are climate experts who disagree with him and can support their contention with objective measurements and facts – Spencer, Lindzen, Choi, Christie, Soon to name a few. That Hansen encourages nuclear power plants is to his credit. The alarmism over “tipping points” cheapens the debate, in so far as it forces one to take a side of either “Who cares about the atmosphere?” or “Who cares about how much it costs, we must do something!” How about a sober assessment of the facts: CO2 is 390 ppmv of which humans contribute 5%, nature is 95% — so humans contribute 20 ppmv. Do you really think a trace gas essential for life on the planet (and known to have been in much higher concentrations in the past eons of time) is going to cause catastrophic climate change any time soon? Really? Can we try this as a possible compromise: (1) All coal-fired power plants must use the latest in Clean Air Act scrubbers for KNOWN pollutants – like NOx, SO2, PM. (2) Expand the use of nuclear power plants of all sizes – mini, Small Modular and medium output and with either uranium or thorium fuel cycles — you re-fuel every 18-24 months rather than daily – so there is less mining footprint and smaller power plant footprint. 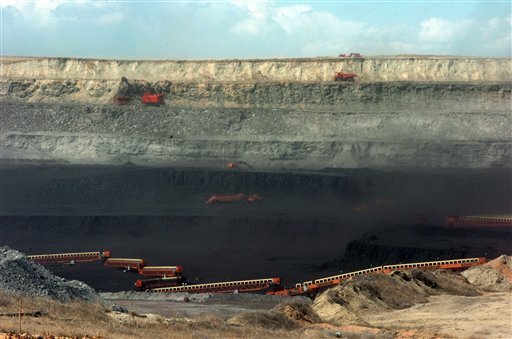 (3) Gradually transition coal mining from electricity generation to liquid fuel (CTL) production so you keep the coal mining industry satisfied, the railroads satisfied and you minimize the importation of foreign sources of fuel. (4) Recycle the used nuclear fuel to extract the 98% of energy remaining from the once-through fuel cycle currently used. We’d get cleaner air, affordable power, high skilled employment, more self-reliance in energy and a renewed manufacturing industry.